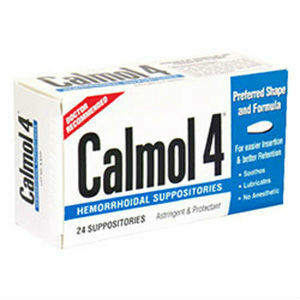 Calmol 4, a hemorrhoid treatment in the form of gentle and soothing suppositories, claims to provide a natural lubrication that counteracts the throbbing pain of swollen hemorrhoid tissues during bowel movements. These suppositories are contoured to a bulb shape in order to facilitate insertion and to make retention easier. It is however, important to keep them in a cool place as they tend to melt in temperatures above 80 degrees. One suppository taken rectally up to six times daily or after every bowel movement. 24 suppositories are available from 14.98 to 18.98 depending on which vendor you purchase from. Using up to six a day makes Calmol 4 one of the least affordable methods of treatment as each box is only a four day supply, and this treatment is ongoing. This product is available with an unlimited warranty. An unused portion can be returned for any reason; however, limits are for one return per family or address. While Calmol 4 is a great product and would be essential in use with other products that treat hemorrhoid pain slowly as a temporary relief, Calmol 4 does not offer any long term solutions to the treatment of your hemorrhoids. John Parker	reviewed Calmol 4	on October 22nd	 and gave it a rating of 3.5.